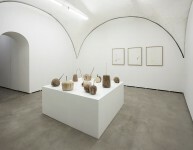 Federica Schiavo Gallery is delighted to present Fuori tema (Off Topic), third Andrea Sala’s solo show at the gallery. 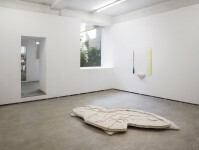 The new body of works comes from the intersection of several apparently unrelated ideas and from an unexpected crossbreeding of common forms and materials that seem incompatible, introducing a new formally autonomous language to the sources of inspiration. When the critics, the historians and sometimes the protagonists themselves tell about the recent past they usually split the history in specific periods of time or movements, labelling them with a proper name – usually ending it with the -ism suffix – which identifies a common attitude and similar ideas totally distinguished from whatever came before or after it. Abstract Art, Expressionism, Metabolism are just some of examples. Nevertheless, these classifications show their limits since several figures who grew up in a movement can be included between two or even more historical periods. Though sharing some of the assumptions of a group, those particular protagonists often disregard its strict requirements and rules ending to new and off topic outcomes. In this exhibition Andrea Sala paid attention to the notion of off topic conferring value to those less travelled ends or marginal spaces between a school of though and its peculiar deviations. According to the artist, the off topic theme describes the human condition of nowadays which, due to the lack of historical distance, escapes an attempt at classification generating an unexpected and indefinable aesthetic. 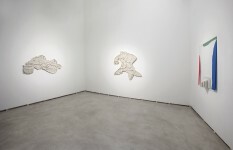 Departing from the positions of Abstract Art, Expressionism and Primitive Art, Andrea Sala has focused on the work of particular artists such as Helen Frankenthaler, Hermann Finsterlin and Henry Moore, and created a series of sculptures loosely based on these movements, conceiving an original code of new forms. The abstract brush strokes of Helen Frankenthaler’s painting echoes on the surface of Sala’s three-dimensional slabs of glass with shaped edges designed around ceramic shelves. The glass has been mechanically engraved on one side by a process of sandblasting and then covered with Bondo, a common and widespread American plastic filler used many repair actions, coloured with oxides. 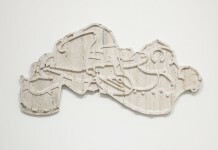 The use of Bondo encourages the contamination of “high” artistic practices and D.I.Y. attitudes, which is spreading rapidly in the aesthetics of the new millennium. The volumetric and organic research of Hermann Finsterlin, who played an influential role in the German expressionist architecture movement of the early 20th century, has been translated in 3D CAD drawings and then transferred in low relief forms entirely industrially carved on slabs of travertine. The accuracy and precision of the mechanical production has been overtaken by the porosity of travertine that shows an irregular perforated surface, ready to be filled with coloured plaster. In a similar way, Andrea Sala’s interest for Henry Moore’s use of primitive, organic and ergonomic forms led him to create a group of sculptures made out of briar-root which became the bizarre pedestals of surreal pipe mouthpieces in bone, bamboo, brass and methacrylate. 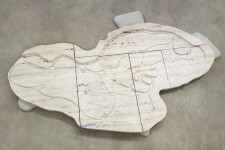 The decision of employing specific materials has a central role in Andrea Sala’s work. The artist selects them according to the imponderables inner features of the matter during each step of the production process. This attitude helps him to undermine the orthodoxy of his initial sources and to accomplish new works more and more corrupted by several influences and definitely off topic.